Does your home’s backyard include a pool? If so, would you make more use of it if you had a convenient area to cool off and relax in between swims? Cabanas offer the ideal spot for you and your guests to dry off and chat while remaining protected from the sun. 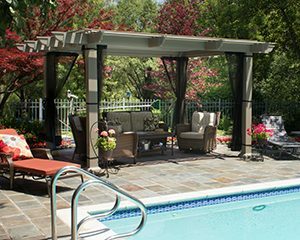 And, for some of the most luxurious spa cabanas in Radnor Township, Pennsylvania, you’ll want to turn to the outdoor living experts at SRA Home Products. We’re pleased to exclusively install cabanas manufactured by TEMO, a national leader in the outdoor living industry. TEMO — a company that’s served more than 100,000 customers across the United States — manufactures their cabanas using heavy-duty, fully extruded aluminum, which is stronger than vinyl, wood, and roll-formed aluminum alternatives. This exceptional material also prevents deterioration, rotting, and insect infestation. Plus, TEMO’s cabanas include their exclusive TEMKOR polymer coating, which protects against scratches, cracks, dents, fading, and much more. And, you’ll be glad to know that our cabanas come with TEMO’s limited lifetime transferable warranty, which you’ll be able to pass on to a future buyer should you ever decide to sell your home. Since being founded in 1988, we’ve completed more than 5,500 projects. There’s a reason why so many homeowners continue turning to us for their backyard renovation needs — we’ve been family-owned and -operated for two generations, and we continue to respect small-town values like honesty and fairness. We place the highest priority on providing exceptional customer service, a quality that’s helped us achieve an A+ rating from the Better Business Bureau. If you’re interested in having one of our cabanas installed at your home, please contact SRA Home Products today. We proudly serve homeowners throughout Radnor Township, PA, and we look forward to working with you.